The old Scandinavian proverb, "There's no bad weather, just inappropriate clothing" is especially true for runners. This morning was so cold that I considered staying inside for my run. My wife was on the treadmill at the time so I would have needed to wait for her to finish. We had morning plans, so to save time I decided to brave the weather and dress "appropriately." I added another upper layer just before heading outside. It's always tricky to find a balance that works. Races are hard, when you're by yourself and there's no place to keep warm before the race begins. I generally dress for my second mile. That can be uncomfortable unless I'm able to park close to the starting line and stay in my car until race time. Training runs, like today, are easier to manage because you can start as soon as you step outside. That extra layer kept me comfortable from the beginning. I wasn't looking to run at race pace which would have put me into overheating territory. It wasn't until near the end that I really began to heat up. Flipping back my glove mittens to expose my fingers helped introduce enough cooling to counteract that heat. That got me through the remaining half mile. Tomorrow is New Year's day and, for most people, it's a recovery day after staying up very late. 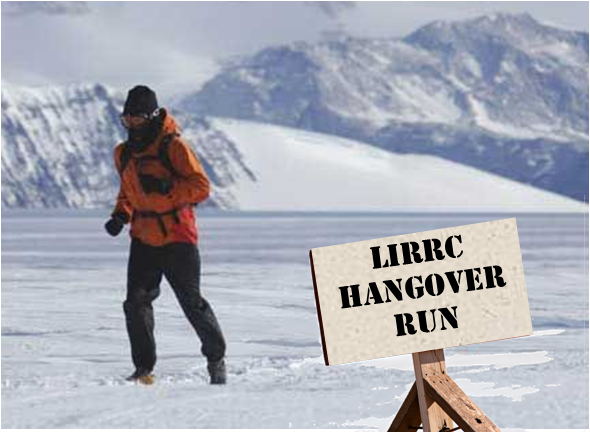 But for me and my two other Musketeers (and possibly a fourth) we'll be gathering in the morning at Eisenhower Park for the LIRRC Hangover Fun Run. The distance is supposed to be 5 miles but we may be going for a few extra. Our speediest-keteer is looking to cover ten. I've done the Hangover event for the past couple of years and both mornings were very cold. The temperature at tomorrow's 9:30 AM start is predicted to be 27°, with winds making it feel like 19°. Since this isn't a race, I'll probably error on the side of too many layers. Just as the Norwegians say, "Det finnes ikke dårlig vær, bare dårlige klær." The Norweigians aren't the only ones who say, "Det finnes ikke dårlig vær, bare dårlige klær." That's my greeting when I pick up the phone. So, I already did my ten. It was schedule for today, not tomorrow. Actually, I never really warmed up during the entire run. My face was just as frozen as it was when I started out. That's a very specific phone greeting, but I'm sure it's appreciated by any Norwegians that are unsure about how to dress at that moment. My face was really cold through my much shorter run today. Since tomorrow is judgement free (in terms of performance and time), I recommend over dressing. Looking forward to see you guys too!